To achieve significant and deep interventions required to meet the challenging targets necessitates a decision-making process that evaluates fabric and technology solutions at an early stage in the design process. The interaction between all the different elements can only be evaluated by dynamic simulation which utilises the laws of physics to simulate how an asset should perform. 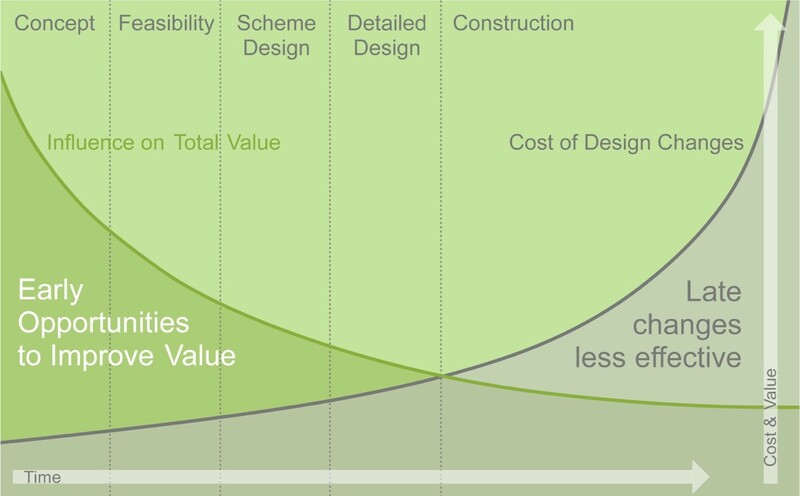 Projects using energy modelling generally exceed the energy reduction targets and tend to encourage good sustainable design where passive design strategies make bigger impact to curb energy use are evaluated and incorporated to achieve demanding targets. Energy modelling from easily obtained data also helps design teams consider all the elements and their likely impact on carbon use where targets can be set and regularly checked against progress. To encourage widespread use of dynamic simulation an on-line web and cloud-based approach is offered by GSL which is affordable and much more accessible to the construction industry. With the need for significant investment to achieve energy efficiency targets new initiatives such as Energy Performance Contracting will require the detailed evaluation of the most cost-effective solutions so that these contacts are well prepared, and risks minimised. Rapid dynamic simulation would benefit a range of building professionals including designers, technologists, fabric specialists/manufactures, energy engineers, contractors and developers. All investment decisions require good planning and risk informed decision making which in turn requires evaluation of fabric/technology solutions long before and capital expenditure takes place. Optimising the impact of solutions can be evaluated to maximise the rate of return on investment. Dynamic simulation tools that are accessible and affordable will enable the construction industry to face the challenge of deep interventions and support this `new` business opportunity where 98% of the problem has already been built. In the next ten years a large proportion of existing buildings will require some form of intervention and support with decision making tools of this nature will enable the industry to take technical and investment decisions that will support this intervention opportunity. A web-based approach allows for on line collaboration where all professionals involved in the projects can communicate and share data virtually which has a resulting productivity gain. Out now and online, the newest gModeller V2.1 to start your Building Performance Simulation! V2.1 has greatly improved performance particulary on MacOS. idf – for the global standard EnergyPlus. nct – for UK SBEM and Energy Performance Certificates. Hello and welcome to the gEnergy Quick Start guide. 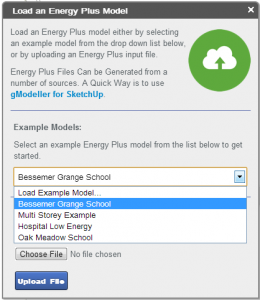 This guide assumes you already have existing EnergyPlus knowledge and is designed to get you familiar with the basics of gEnergy to allow you to start simulating your own buildings and projects as soon as possible. Click “Import IDF” from the options at the top of the gEnergy screen. Select ‘Bessemer Grange School’ from the dropdown menu. You can also choose your own IDF files to upload to gEnergy from here. Don’t worry about file versions, gEnergy will automatically make your IDF compatible with the latest version of EnergyPlus that is required. Once you’ve chosen your file, click Upload File. At this point, you can make any changes you wish to make to the model, if desired. 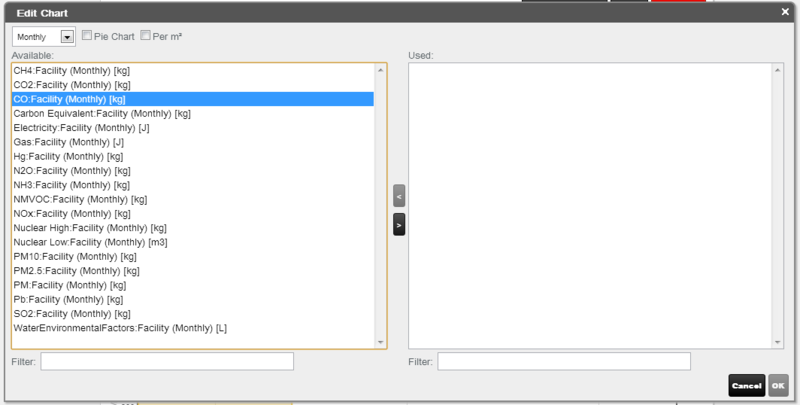 To do this, click a ‘Group’ on the left, this will open the group’s objects in the Object window. To edit an Object’s properties, simply left click the object in the Object list and edit it in the EnergyPlus Object Form located at the bottom right. However, for this quick demonstration, you want to just click “Run Simulation”. The message console will appear and start running the gEnergy simulation. You can view your simulations progress in this window. When this is completed, click on Reporting: Charts. 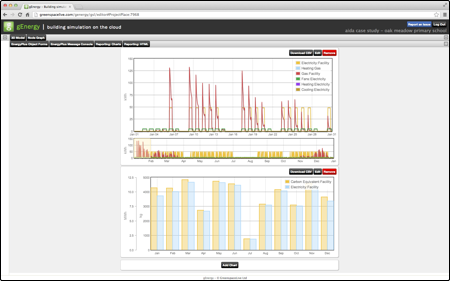 You now know the basics of gEnergy, why not add your own IDF and try it for yourself? gEnergy features an extensive and extensible library of pre-populated building objects. Select and drop library objects into a model to begin using them. 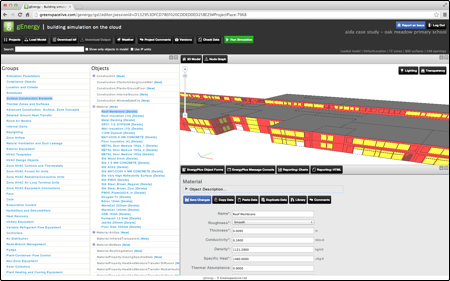 Using library files allows you to quickly populate models with pre-built information. This can be standards based, or come from component manufacturers. Library items can also be used as templates and modified according to project requirements, as a productivity gain. Adding from libraries is easy in gEnergy! You can learn more about gEnergy’s features here. Or why not start a free trial here and experience the power of gEnergy today. Our gEnergy testing is well underway, and we’re happy to see people using it extensively! We’ve added some new features and improved some existing ones since our beta launch, see below for details! 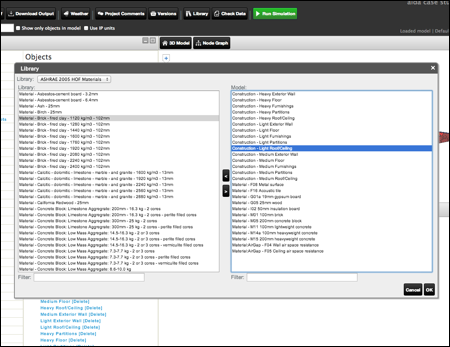 Multi Select and Editing of Objects – the ability to edit multiple objects at the same time. This is a big productivity booster for larger models with lots of similar objects (e.g., walls, etc). WebGL 3D view of building geometry – very fast in modern browsers. Also, downscales to normal non-WebGL 3D view for older or mobile browsers. Highlights areas of the 3D model being edited, e.g., Zones, Surfaces, etc. 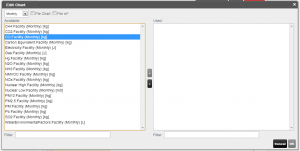 Editable charts – choose what outputs are displayed on each individual chart. Drag and Drop schedule editor – edit schedules using a popup calendar where you can drag and drop days and values. Also chart based editing. 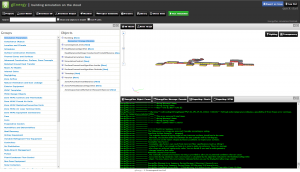 Energy Plus console – view energy plus output as its running, useful for debugging. Export EnergyPlus raw output for downstream analysis. Ability to edit every single object in EnergyPlus – not just restricted to buildings. Is gEnergy missing a feature you want to see? Let us know! beta / gEnergy / New Feature / Uncategorized — Comments Off on Introducing gEnergy and our Beta test program! Introducing gEnergy and our Beta test program! gEnergy brings building simulation to the cloud, enabling architects, engineers and building owners to design and operate energy and resource efficient 21st century buildings. 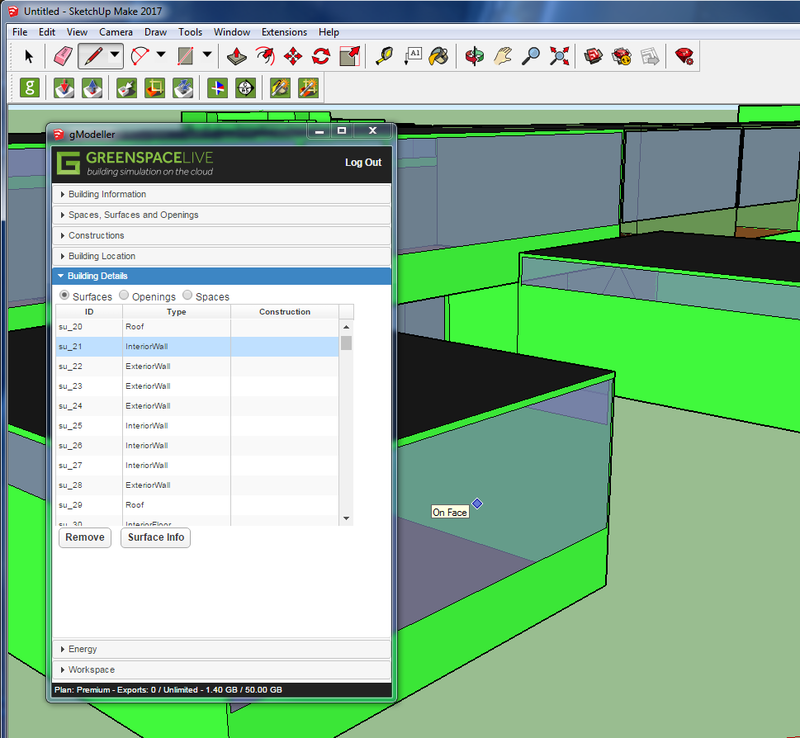 A new addition to the greenspaceLive gTools suite, gEnergy, is a powerful building information and energy modelling tool using the EnergyPlus platform. New-build and retrofit modelling scenarios can be rapidly explored, minimising construction and operational stage problems, raising design-team productivity and lowering cost of build and ownership. 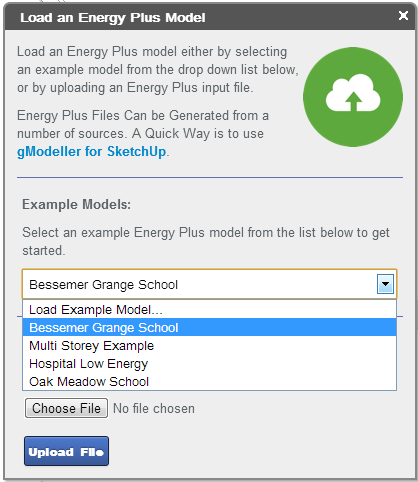 gEnergy enables creation of new EnergyPlus models and imports SketchUp, Revit, gbXML and IDF models. Over 600 building objects, constructions and HVAC systems are supported in our easy to use Web interface. Beginning today, the gEnergy Beta Program will give existing subscribers access to gEnergy before our general release. Our goals with this program are to expand our pool of testers and gain feedback across a more diverse set of devices. Just by using gEnergy and reporting issues, beta testers will be able to help us improve performance on a wide variety of browsers and devices we may have otherwise been unable to test at scale. This will give greenspaceLive the opportunity to eliminate any issues and identify the diversity of our user base to test our future gEnergy builds so, when we release to the open market, everyone has a better experience. Whether you use Firefox, Chrome or Internet Explorer, more complete testing coverage gives us the opportunity to make sure more people can access a stable high-performance platform. Anyone with an active subscription can join the beta program. 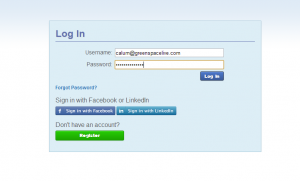 You can access gEnergy through its portal on our website. We ask that you use gEnergy like you would normally use an EnergyPlus editor, but that you submit a report whenever you encounter a bug or other issue. Because gEnergy will be a Beta build, it will have features that may still be in progress and as a result, be less stable than you may be accustomed to. Feedback on stability, as well as any other performance issues you experience, is crucial and deeply appreciated. If you have any questions about our gEnergy beta program, or regarding the software, contact us! We’ll be more than happy to answer your questions.